Feeder preview new album at Norwich UEA. Fifteen years since the bands first release (which they sold at their own gigs) they are once again releasing music for themselves. With 25 hit singles under their belt, 4.5 million record sales, 6 full length-studio albums – as well as the double platinum ‘Singles Collection’ from 2006 – founder members vocalist Grant Nicholas and bassist Taka Hirose with drummer Karl Brazil are going back to their roots, self-releasing on their new label Big Teeth Music. As passionate as ever, but with a renewed sense of energy and excitement the band entered the studio last year to record songs written over the last 18 months. With no label to appease or interfere, Nicholas felt like the band were starting over again and the energy and chemistry of the early days comes over on the new record. The energy of ‘Call Out’ is infectious and sets the tone for this very raw, very honest album. 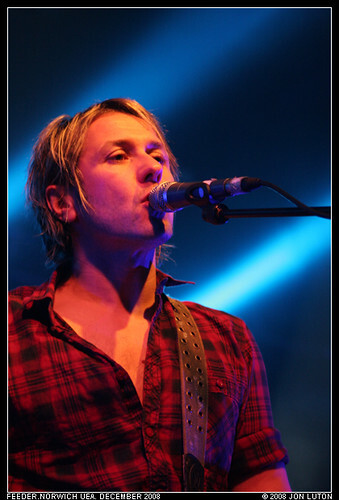 Production is stripped down but they have kept the melodies and dynamics of what makes the classic Feeder sound.